In their role as a Virtual Prime Vendor for the Defense Supply Center Philadelphia (DSCP), Peckham is one of three contracted warehouses in the country responsible for the distribution of military recruitment clothing. Peckham provides service to an eight state region including direct shipments to Fort Sill and Fort Leonard Wood. Since opening in May of 2001, Peckham has shipped more than 52,000 orders with a 99.9% accuracy rating. 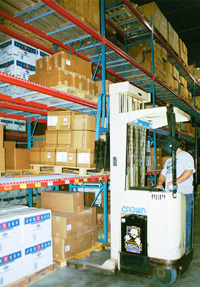 This accuracy rating is due in part to Peckham's state-of-the-art Warehouse Management System (WMS) from Ann Arbor Computer (AAC). "Knowing we needed a robust warehouse management system, we were looking for a vendor with experience in government contracts within a 3PL environment, we received that from AAC" states Tom Minich, Peckham Warehouse Manager. The addition of a new warehouse contract prompted Peckham's search for a WMS solution. Their primary goal for implementing a WMS was product accountability. Peckham chose pcAIM WMS for its accuracy, robust functionality and competitive price. They selected Ann Arbor Computer for their years of integration experience supporting various vertical markets and their ability to meet Peckham's government-related and nonprofit organization needs. Implementation at Peckham began quickly with a basic pcAIM installation to meet the requirement date set by Peckham's government contract. Government contracts have specific requirements for transactions generated from the WMS to the vendor whenever product is received or shipped. pcAIM satisfied these requirements by developing an interface using shared Microsoft® SQL Server tables to Peckham's existing application Legacy Host. After the government interface requirements were met, an enhanced version of pcAIM was installed with expanded functionality. "The most challenging aspect of the installation was learning the logic involved," says Minich, "Once I configured pcAIM, based on the system's logic and our criteria, things ran pretty smooth. Time spent setting up the system provided me with hands-on knowledge of pcAIM. I feel that I now 'own' our system and I am confident that pcAIM will meet our needs, now and into the future. This project was a complete success." By using pcAIM, Peckham is able to maintain a shipping accuracy rate of 99.99% and an on-time shipping rate of 99.98%, well above the national average as documented in Warehouse Education Resource Council's (WERC) Private Warehousing: A Snapshot (1/31/02). WERC's national average for shipping accuracy is 96.90% and on-time shipping is 95.85%. Minich explained "I am very pleased with pcAIM and would recommend this software to anyone looking for a WMS".